Two companies planning to build wind turbine factories in Scotland are in talks to form a joint venture, which could mean reduced manufacturing plans. Gamesa of Spain and French firm Areva both announced in 2012 they planned manufacturing in the east of Scotland. They have committed to "fulfil existing industrial development commitments in the UK and France". The Scottish plans, for manufacture on two sites, are not yet firm commitments. That suggests the joint venture makes it less likely the companies will wish to build both planned Scottish plants. A spokeswoman for Gamesa, which said nearly two years ago that it aims to create 1000 jobs by building in Leith, said it is too early in the joint venture talks to say what effect it could have on manufacturing. Areva said in November 2012 that it wants to build a plant, and could create up to 750 jobs. This was expected to be in Dundee though it could be in Edinburgh's docklands. Although the UK market for offshore wind developments is expected to become the world's biggest, it is only one part of the new joint venture's global reach. The two main focuses are in northern Europe and in Asia. The agreement announced on Monday is to negotiate on a 50/50 joint-venture company. That would allow for joint research and joint efforts in "industrialisation capacity and expertise in the development of a supply chain, both internal and external". The companies expect to combine their efforts in learning from onshore developments and applying them to offshore wind. Both companies are understood to be in the development phase of creating the nest generation of wind turbine equipment. Areva, based in Paris, has been in offshore wind since 2004, and is currently installing 120 turbines in the North Sea. It is also a major developer in the nuclear power industry. 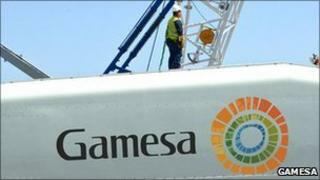 In Madrid, Gamesa has been in the wind energy sector for 19 years. Luc Oursel, president and chief executive of Areva, said: "By choosing to create a European offshore wind champion with GAMESA, AREVA is playing a key role in the consolidation, already underway, of the offshore wind sector, and confirms its long-term commitment to renewable energies". Ignacio Martin, chairman of Gamesa, said: "This agreement with AREVA allows GAMESA to position itself as a market leader in the offshore wind industry". Alex Salmond, the First Minister of Scotland, commented on the planned merger: "This is great news and the Scottish Government will continue to work closely with both companies to support their plans and ensure maximum benefit to Scotland from this joint venture. "I look forward to discussing plans for the future and for Scotland with both companies as we seek to maximise our offshore wind potential."